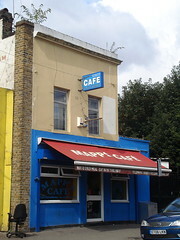 Cafe in Hackney Wick, next to a car scrapyard and about 250 yards from Hackney Wick Station on the border of the Stratford area that was redeveloped for the 2012 Olympics. It's a typical working man's (person's) caff, basic but clean in contrast to its surroundings. It seats around 40 at freestanding chairs and tables, somewhat crammed in to the small space. Newspapers are available — the Sun and the Mirror. The menu is the usual one for a cafe of this type — omelettes, jacket potatoes, sandwiches, fried breakfasts, and a few main meals such as lamb curry. macspite visited in September 2007 and paid £4.40 for egg, bacon, sausage, tinned tomatoes, beans, bubble, one slice of toast, and tea photo. The bubble was strange, mainly green dyed mash with a couple of crunchy bits in. Kake visited in August 2014 and paid £5.20 for egg, bacon, beans, bubble, 2 slices of bread, and a cup of tea photo not including the tea. The bubble again seemed to just be mash, with no discernable cabbage, though it had some nice browned bits from the grill. The rest of it was fine but nothing special. There were about a dozen other people in at 11:15am, about half of them in hi-vis jackets. Service was friendly and welcoming. Accessibility: A step to get in. Two more tiny steps (via an open yard) to the toilets. Chairs and tables are freestanding, not fixed, but it's very cramped. Last visited by Kake, August 2014. Opening hours taken from sign on door on that visit. Last edited 2014-08-17 15:21:41 (version 4; diff). List all versions. Page last edited 2014-08-17 15:21:41 (version 4).